I really loved these large ceramic pots, especially in the company of a very unusual violet version. 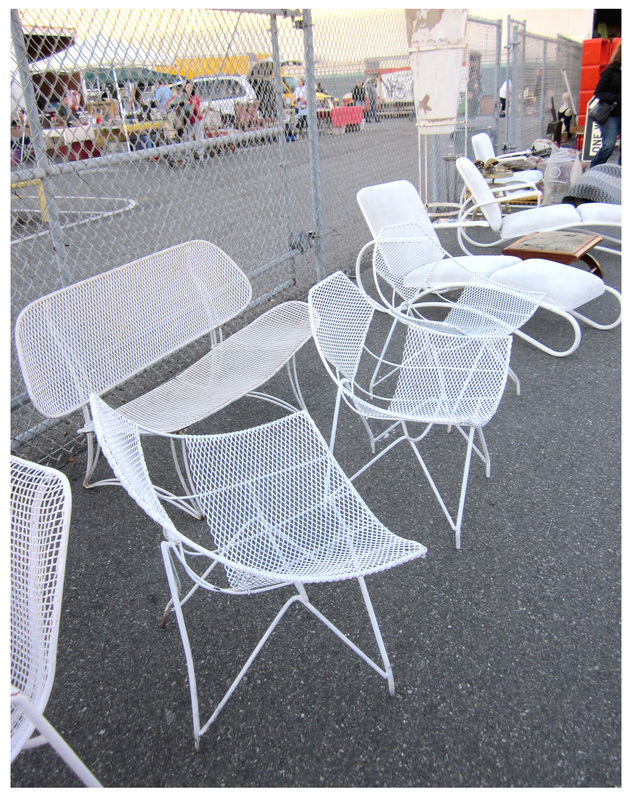 $100 each at 7:15 a.m., the vendor advised that the price would be much lower if they were still there late in the day. 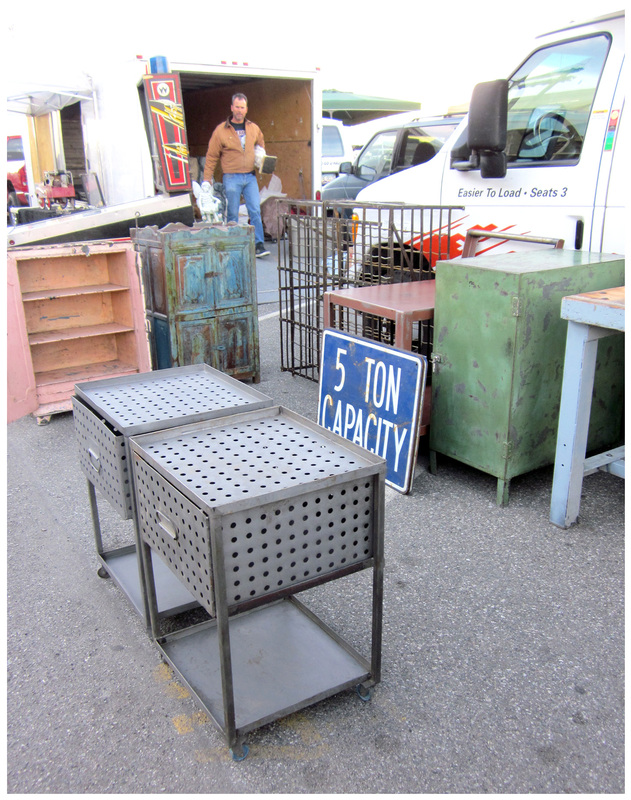 Industrial goodness could be found in every aisle, but I really like these dot-perforated drawers. These would work great either indoors or out and have a nice graphic presence. All low-slung grooviness, these curvy numbers are cocktail party-ready. Their cool whiteness would pop perfectly against Pucci or Marimekko print pillows. 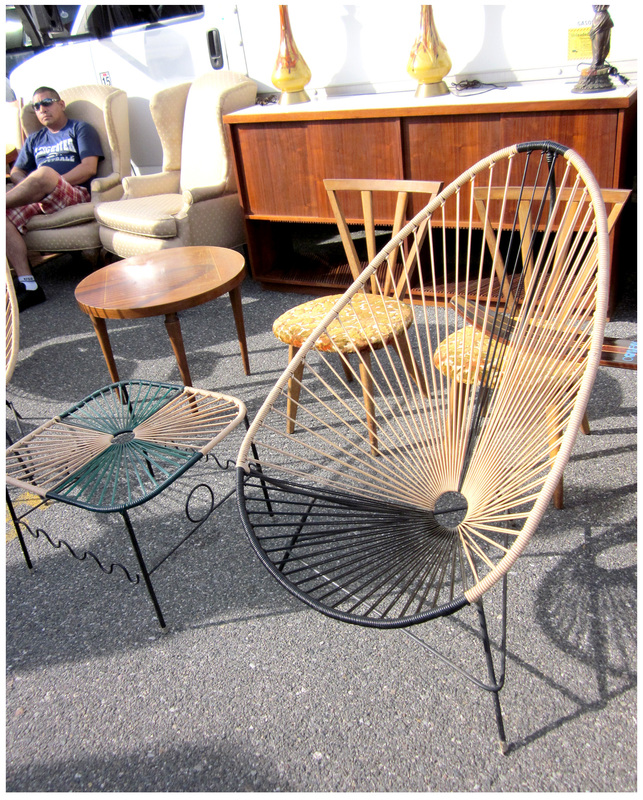 A great set of Mexican vinyl-strung chairs and a table were pretty expensive at over $400. Used only gently, they were in terrific shape, if an odd color combination. 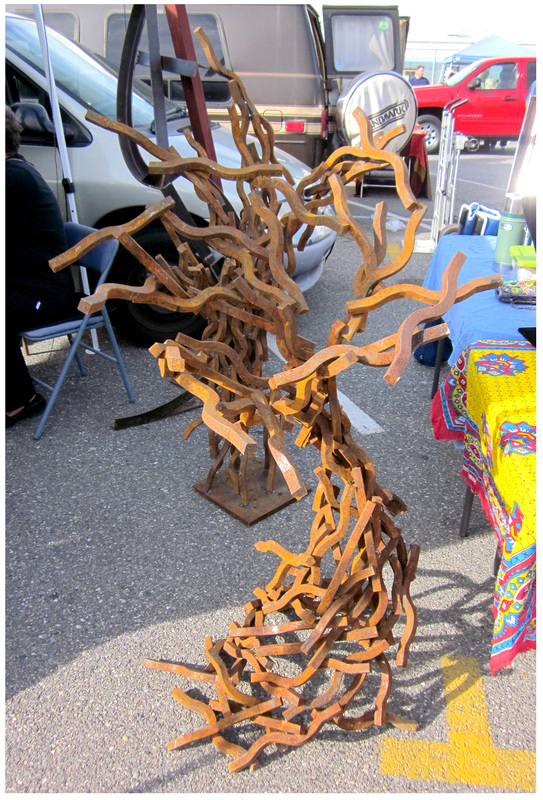 More than $400 by $50, these twisty rusted steel sculptures were like metal tornadoes. The sculptor’s mother/publicist was in attendance and she said they’re selling briskly. 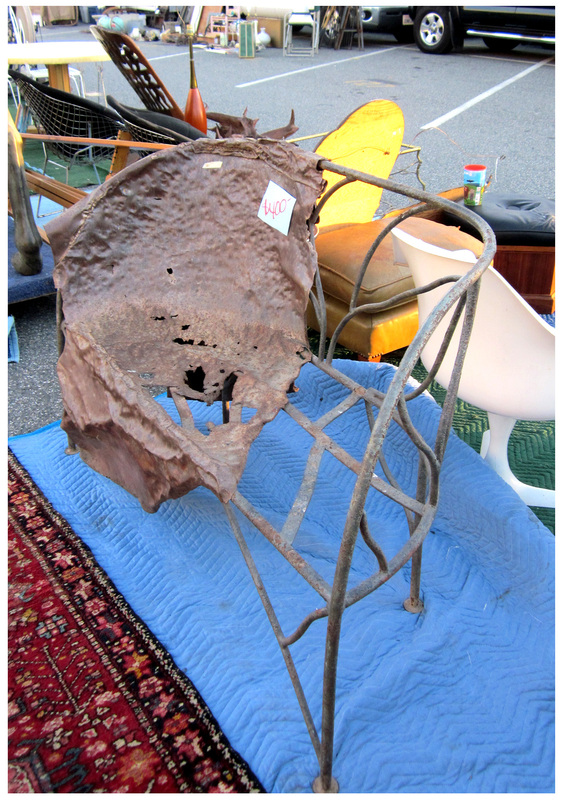 I really loved this metal-draped outdoor settee, in spite of its obvious condition issues. 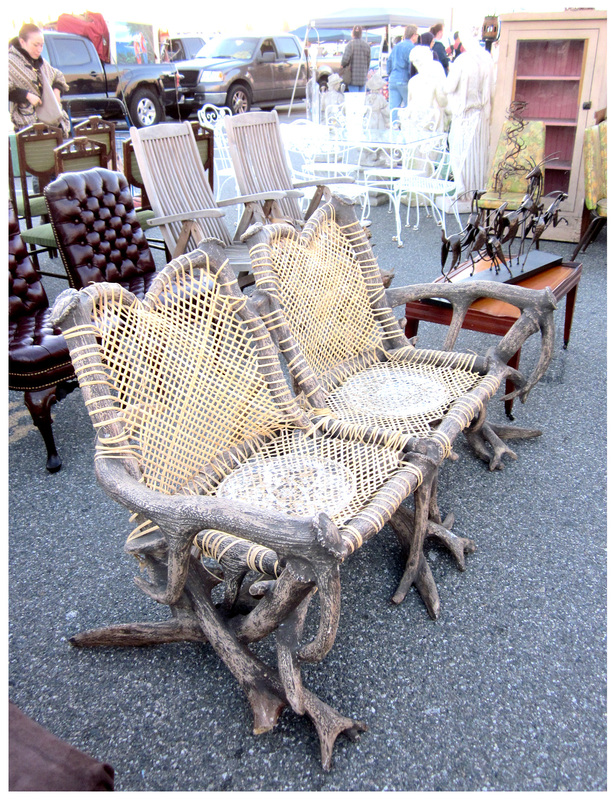 It’d look great with a vine of some sort growing up through its seat … again, $400 is the favored price. 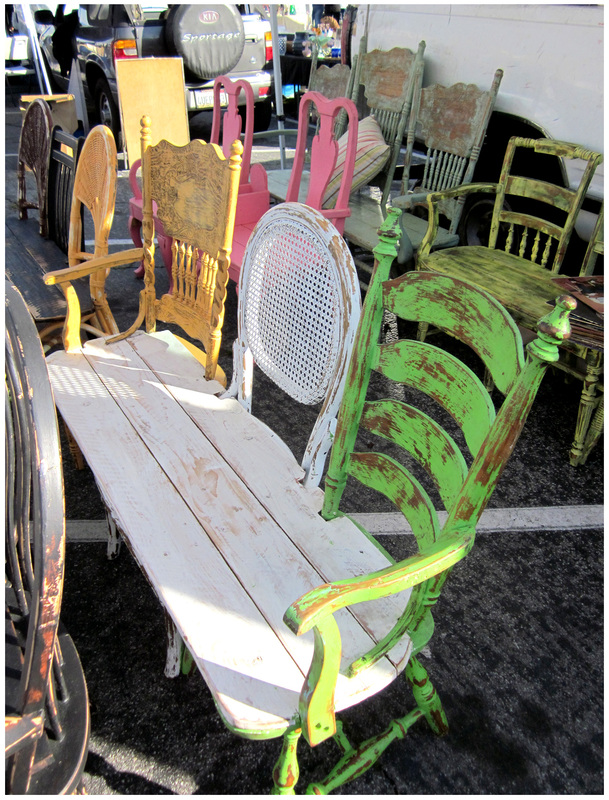 These whimsical mash-ups of disparate chairs-become-benches are colorful fun. A mere $250 each, they’re a great deal if you ask me. 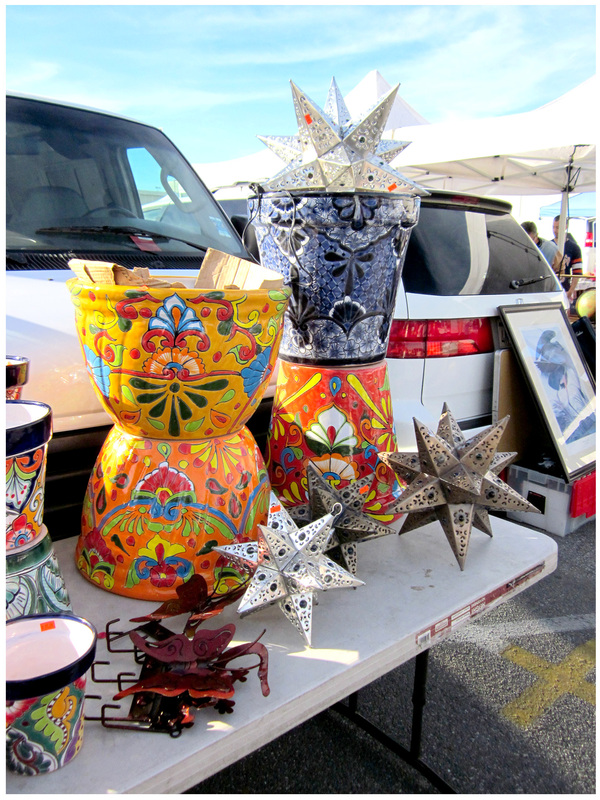 A patio dressed with these exuberantly-hued Mexican pots would be fiesta-perfect. Add punched metal star lanterns and you can make it an all-nighter. Certain that Mike’s set-up is now complete, I circle back before temptation gets the best of me (I’d vowed that I’d buy ONLY plants this flea trip). 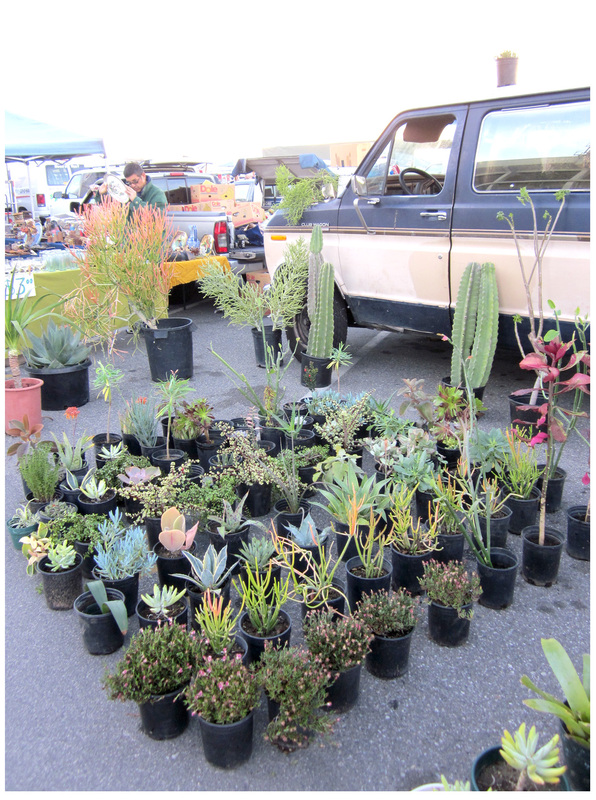 He’s already loaded my bainsii on his dolly but busy with other customers … so I tiptoe down the row to another plant vendor to check his wares, where I find more plants for the Rancho. Back at the Rancho everybody looks right at home! 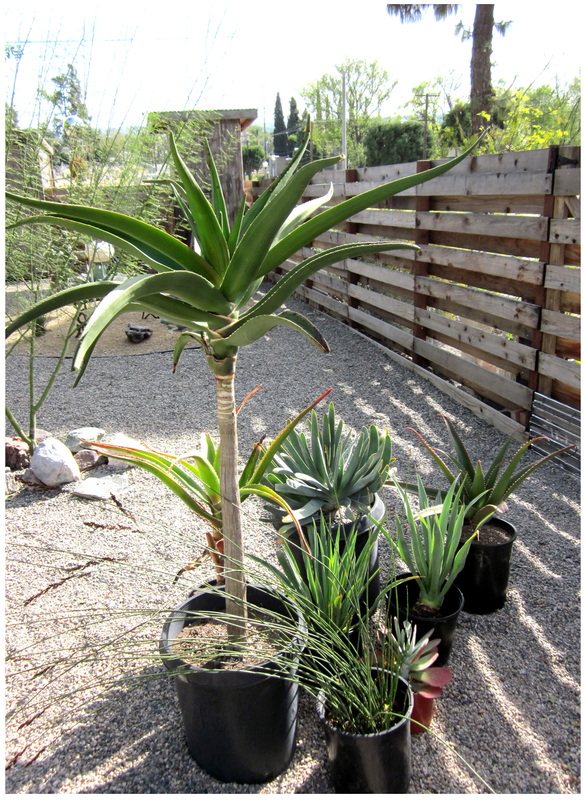 At almost six feet, my aloe bainsii tree is perfect, and the other new plant additions will fill some of the empty spaces left when I sold/gave away all the other pots at my last sale. Courtesy of craigslist, some new rockin’ planters have appeared in the garden and will be featured in an upcoming post … Things are really looking great again now that the rains have gone elsewhere and I’m enjoying being able to work outside hours-at-a-time, creating new vignettes and looking at things with a fresh eye … more soon! 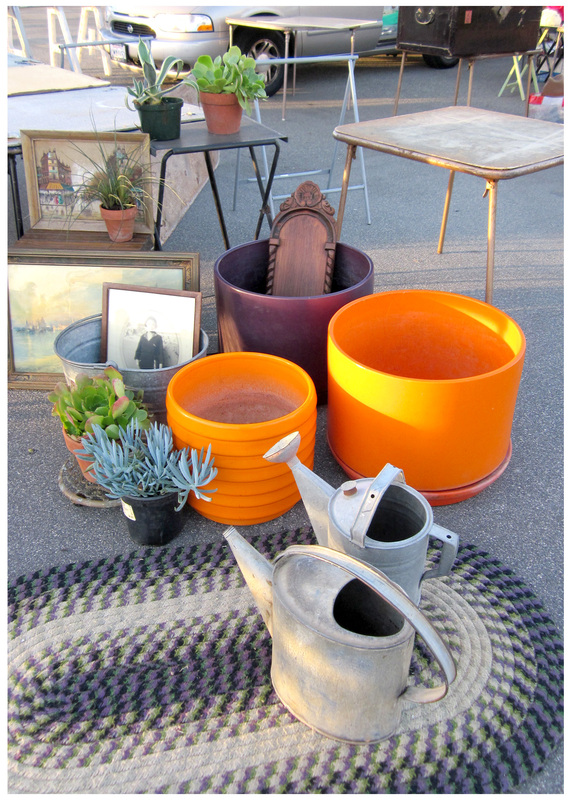 Very Quest for Fire — (so glad we get the same movie references) Looks like a fine day at the flea mkt — that orange banded container with the eggplant purple are juicy. 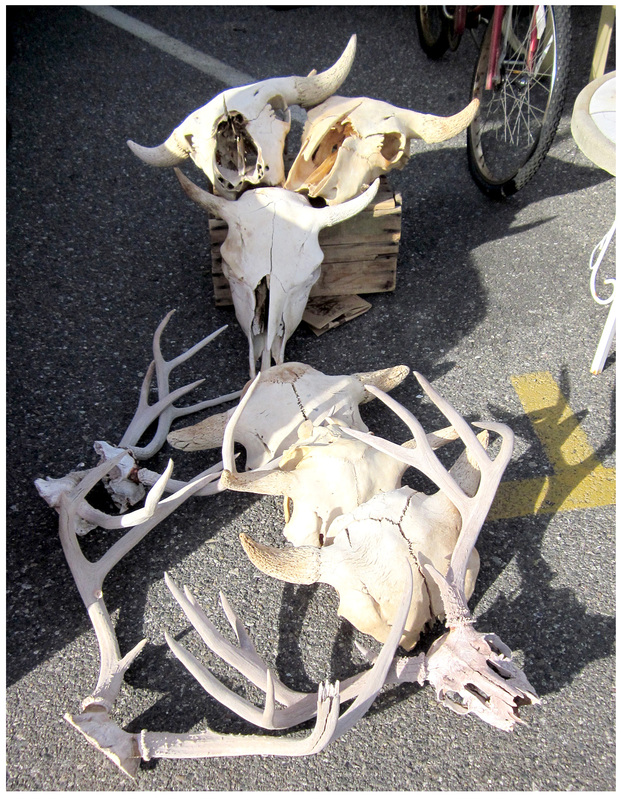 I’m filing away Mike Delgado’s name for future flea mkt trips. Maybe I’ll get a Rancho discount! Who could forget Rae Dawn Chong’s turn as Malibu Cavewoman! dang it all!! my friend carey over at one laguna life (www.onelagunalife.blogspot.com) asked me to go with her yesterday, but i was too lazy. she also posted about her scores! i already have it marked on my calendar for next month, 3rd sunday! i’m totally seeking out your plant guy there!! loved seeing the cool stuff!! thanks! The challenge for me, Matti, is walking away from these things … it ain’t easy!